I live in a wonderful community, one where people come out of the woodwork to rise to the occasion and come to the aid of anyone in need. I have been on both sides of this practice and let me tell you, being the receiver of this kindness is a lot more difficult. When a family is in a crisis of any kind – usually health or loss – our community springs into action and gets things done… in a big way. Dinners are sent in, carpools are covered, birthday gifts are wrapped and rides to parties and after school activities are covered. This army of giving jumps into action at a moment’s notice and no one bats an eye at getting the job done. I have a friend who is currently in this place right now. We have the best job of all, we get to dog sit during the day while she goes to work. Talk about reciprocal giving! (for those who are not regular readers, we lost our dog a month ago and cannot get used to a dogless house). She and I were sitting in my kitchen yesterday talking about how overwhelming it is to receive such kindness. My first thought was about the chicken dinner on Friday nights. 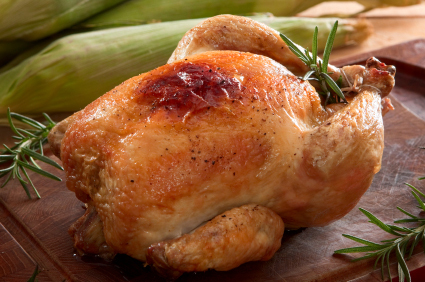 In the Jewish faith, a friday night – or Shabbat dinner, usually showcases a chicken. Jews feed for comfort and there is nothing more comforting than a roast chicken dinner. You don’t want to be the one that gets the chicken! Giving the chicken is cool. Making the chicken is wonderful. Dropping off the chicken feels so good because there is so little you can do to help someone close to you who is suffering. But GETTING the chicken? Oy, that is the ultimate admission that you are in a time of need; a time of crisis. I am thinking that the damn chicken might have been the thing that broke me in my darkest hours. But in all seriousness, there is never a day that goes by that I am not grateful for what this town has shown it can do for its own; and making it look so easy in the process. It is a very special place indeed. FYI, this family has used a wonderful website called lotsahelpinghands to help manage their needs. I urge you to check this out, while I hope that you never need to use it. Their tagline is ‘Create Community’; in our case it is simply ‘Enhance Community’.